spirituality – All things metaphysical. I have compiled my top five tips on learning to read the tarot. Other readers may have different opinions, but this is my blog, so I’m offering my opinion. I welcome the feedback of other readers in the comments. Tip 1 – Purchase the Rider Waite Tarot Deck (this includes the Radiant Rider Waite or Universal Rider Waite). I believe that this is the ideal deck for anyone who is learning to read the tarot. My reasons for this are numerous. One, almost every book you read when learning the meanings of the cards will feature images from the Rider Waite. This makes it very simple to transfer the knowledge from the book to the cards you are working with. Two, almost all tarot decks available for sale are based on the imagery found in the Rider Waite. If you can learn to read with this deck, you can learn to read with nearly any deck you want to work with. Sometimes when I read with an art deck (like the Wild Unknown), I close my eyes and see the images from the Rider Waite to help me determine the meaning of a card. I am very glad this was the first deck I learned. Here is a comparison between the Rider Waite and some other popular decks. Can you guess the meaning of the card? Do you see how the card on the right doesn’t convey quite the same meaning? The meaning is the same, but it is harder to intuitively pick up on it. Tip 2 – Purchase books on the meaning of the tarot cards and read, read, read. There are a growing number of readers who identify as intuitive readers (meaning they use their intuition alone to determine the meaning of the tarot cards), but I think it is critical to learn the traditional meanings. This will enable you to work with more decks if you choose to expand your collection. It is relatively easy to read the Rider Waite intuitively, especially the minors. But when you work with more abstract decks like the Thoth or the Wild Unknown, it is great to have an index of symbols and meanings associated with each card. I also suggest you seek out information from the best and brightest in the field of tarot. My personal favorites include Benebell Wen, Marcus Katz, Rachel Pollack, Mary Greer, Eden Grey, and Joan Bunning. Here are a list of some of my favorite tarot books. Tip 3 – Commit to drawing at least one card daily. Each and every day, draw a card in the morning. Write it down in a journal along with the date. Write down everything you know about the card. As the day progresses, be sure to pay attention to how the energy of that card plays out in your life. At the end of the day, write down any notes from what you observed. Then, look up the meaning in one of your books and jot down any meanings or symbols you may have missed. The best way to truly learn the meaning of a card is to experience it on your own. Journaling is an excellent way to record your personal experiences with each card in the deck. You aren’t going to learn tarot without commitment to studying regularly. When I was learning I didn’t go a day without reading, listening, or talking about the tarot. Podcasts, audiobooks, regular books, blogs… Consume them all. Personally, I would recommend tackling the meaning of the cards in the following order. For some reason, court cards were the most challenging for me to master. I suppose that is why I saved them for last. You may wish to tackle them first. The choice is yours. I also recommend sticking to the upright meaning of each card at first. Reversals can be very confusing for a beginning reader. Tip 5 – Join the tarot community. The tarot community is alive and thriving. Where I live, I am lucky to have an entire “fortune-telling family” that supports and encourages each other. If you live in the Tallahassee area, there is a fantastic FREE tarot class held every Sunday by one of Tallahassee’s best and most experienced readers, Leah. Please contact me for details. These are the people you need in your life! Sadly, this isn’t a possibility for many people throughout the world. Fear not, because as long as you have Facebook, you are among friends. Reach out and join some tarot groups. Here are the Facebook groups I couldn’t live without. If I follow these tips, how long until I’m proficient with tarot? I would say that with six months to a year of devoted daily practice and study you can learn to read for yourself, as well as friends and family, rather fluently. Under no circumstances do I feel it is ethical to charge for readings until you have completed at least 50 free readings for your friends, family, and strangers. Once you are comfortable with several spreads and can ascertain the meaning of the cards without using a guidebook, you may be ready to charge for a reading. You may decide never to charge for a reading. Whatever floats your boat! Also, I don’t believe there comes a point in the life of any tarot reader when you are finished learning the tarot. The truth is, professional tarot readers never tire of discussing and learning about the tarot. As a tarot tribe we all learn from each other. The more we work with others who share our passion, the better we get at our craft. The task of learning about tarot is never done. Here in the United States, yesterday was Election Day, but I will more fondly remember yesterday at the day MY MOTHERFUCKING WILD UNKNOWN tarot deck finally arrived! I was so excited to finally have this deck in my possession, having ordered it on September 25th and being forced to wait what felt like forever. Once I took it out of the Amazon packaging I promptly poured myself a big glass of wine and filmed my first unboxing video, which I immediately deleted because it was so terrible. I’m not made for film, folks. The deck and guidebook did not disappoint. I am honestly so impressed with every aspect of this deck. Kim Krans created a beautiful work of art when she designed these tarot cards and the packaging for them is just as exquisite. The kit contains a gorgeous, sturdy guidebook that is really well done. I find the card meanings align very closely to a traditional Rider Waite deck, though the art is certainly different. The card stock is pretty good, maybe a little thin, but far better than some other decks (Thoth and the Gilded Tarot, for example). The biggest distinction with this deck is that is features only animals, no people. For some that may be a turnoff, but it wasn’t a problem for me. The court cards feature owls (swords), snakes (wands), swans (cups), and deer (pentacles). Here are the “Fathers” of the court, aka the Kings. Now, I present to you some of my favorite cards from this truly rewarding deck. I am enthralled by the artwork on this deck and highly recommend it to anyone who may be considering adding this to their collection. I am looking forward to using this for my daily readings. I am an intuitive reader who prides herself on honest and open readings, and I consider it an honor and privilege to connect with spirit and help people. I am committed to an ethical spiritual practice and ensuring that my clients are satisfied with their readings. Tarot readings are a tool for providing you with divine guidance in life. I take my responsibility as a tarot reader very seriously. If I cannot establish a connection with you and spirit, I will end the reading and refund your money. Most of the time, however, spirit shows up and information will begin to flow. My office, encapsulated by the Florida sun. A reading can greatly benefit people who are open and empowered to take control of their lives. I believe the future is predictable, but not predetermined. We have the power to change the future and that power lies in our day-to-day actions. In a tarot reading, we will analyze where you are. We can then look at your future and give you an idea of what you can expect if you stay on your current path. If you do not like what the cards predict, we can discuss strategies to change your outcome. It’s easy to get a reading from me – even if you are across an ocean. Spirit doesn’t require that we be in the same place at the same time. I am able to connect energetically with only your name, though I find a photo and birthday to be very helpful in establishing a connection. If you are on the fence, please check out testimonials from my clients on my Facebook or Etsy page. If you have questions you can always contact me here (it may take up to 24 hours for me to respond). Visit my Book a Reading page and locate the kind of reading you want. Payment will be sent through PayPal. I will contact you within 24-48 hours to confirm that I have received your payment and verify the details of the reading you wish to receive. Once you have ordered a reading please send me your name and date of birth. I also need you to send me your question and the method through which you wish to receive your reading. You may send any additional information or other necessary details about your situation if you wish. I find a photo can be helpful in connecting with a long-distance client, and the birthday allows me to delve more fully into astrology which complements the tarot. I will call/contact you at our scheduled time. If you do not answer or respond, your payment will be forteited. Make sure you are in a quiet space and will not be interrupted. Prepare your questions in advance. Refrain from asking the same question again and again – this will never produce a good reading. The future is not predetermined! If you do not like something that comes up in a reading, know that you always have free will and can alter your life any way that you wish. Timing is the hardest thing to predict. A tarot reading can only give a general outlook on timing. Make your question as specific as possible. If you have requested a general reading, you may respond with three follow up questions. Once completed, your reading is done. If you want to continue to go deep on a question, it may be best for you to seek a phone reading instead. You may ask between 1 – 3 follow up questions within several days of the reading and I will gladly respond. Do not try to wrap more than one question into one. It may confuse the energy of the reading. One thing at a time is always best and leads to a more focused answer. Please refer to my ethics and business policies here. I will not perform readings on medical, health, pregnancy, or any other issues for which I am not qualified. I do not “tarot stalk,” meaning I will not read to pry into someone else’s life except for how it may intersect with your own. Once I receive payment and your information, all readings are usually completed within 24-48 hours. If you book a reading over the weekend or during holidays it may take longer but I will be in communication immediately as to timeline. I reserve the right to refuse to read for any client and will refund any money paid. I will not read for anyone under 18. Earlier this year I visited the mecca of the psychic world: Cassadaga, Florida. This quaint, sleepy town is the hub of the modern spiritualist movement. It has been termed, “the psychic capital of the world,” with more psychics and mediums per capita than anywhere else across the globe. A myriad of psychics located directly across the street from the Cassadaga Hotel. How did this come to be? Were individuals with psychic abilities drawn to this region of Florida like a moth to a flame? I’m afraid it isn’t that interesting, but still notable. In the early 20th century a group of people within the budding spiritualist movement left their home in upstate New York following their leader, George Colby. As a young man, Colby was told during a séance that he would someday be instrumental in founding a spiritualist community in the south. In 1875, that prophecy was fulfilled when he was led through the wilderness of Florida to an area surrounded with hills by a spirit guide named “Seneca.” There he established the Cassadaga Spiritualist camp, fondly named after the city of Cassadaga, New York, that he and the others had left behind. The first night there my husband and I enjoyed dinner at the historic (and haunted) Cassadaga Hotel, which hosts séances twice a month with one of their seasoned mediums. We did not attend the séance, though I did have a session with esteemed medium Rev. Judy Cooper while I was visiting. One night, 15-minute tarot “mini-readings” were being offered during dinner, and I encouraged my husband to get one. It was disappointing to say the least. The reader was insistent that my husband, if not currently in the medical field, would work in the medical field soon. When he explained that he actually manages a very successful pest control office, she was insistent that he would go back to school and become a doctor. Now I don’t claim to know the future, but this really missed the mark for us. The odds that my husband will quit his job, go to college for the next 8 years, and become a doctor are about as likely as winning the lottery. Nonetheless, he shelled out $20 for the reading and returned to dinner with me disappointed with the experience. When it comes to psychics and mediums, there are quite a few phonies out there who spoil it for the rest of us. These individuals bring shame upon us lightworkers who honor spirit and only operate from the highest good. I have spent most of my life as a public servant and a teacher, and I am committed to working with the tarot with only the highest ethical standards. I will tell you what I see in the cards, honestly and clearly. If we do not connect during a reading and I cannot be certain of the message, I will not take your money. 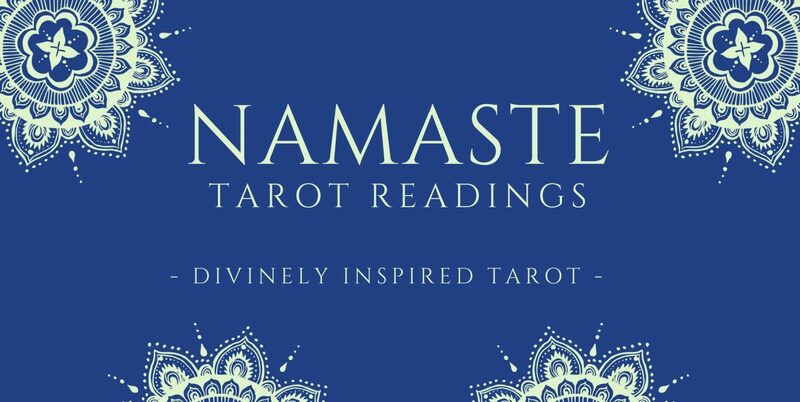 Please take a moment to review my ethical principles and business policies that govern my work at Namaste Tarot Readings and let me your thoughts below. What do tarot readers do? What does it mean to be a tarot reader, anyway? First, I cannot read your mind, nor can I tell the future. The tarot reveals much about our past and present, as well as the larger forces at play in our lives. In exploring these themes you can glimpse at a likely outcome to a current situation. However, it is important to note that though the future is predictable, it is not predetermined. But how does tarot work? It boils down to the belief in Spirit. We are all made of the same stuff – loving energy and light. Inside each of us is God’s incredible and powerful DNA. The energy that flows within each of us is known by many different names throughout the world. Christians call it the Holy Spirit. In Chinese medicine, it’s Chi. Yoga refers to it as Shakti. In the West, it’s commonly called Spirit. All great spiritual traditions talk about spiritual energy and the energetic body. It’s this same energy that some mediums connect with when the spirits of loved ones leave their physical body. Whatever the tradition, the energy and spirit within each of us is meant to flow. Blockages can result in physical and spiritual issues. When we shuffle a deck of tarot cards (or your reader shuffles them for you), the cards are connecting to your energy and spirit. They come together in a reading to reflect your unique energy. The 78 cards capture the entire human experience from birth to death. The 21 cards of the major arcana depict the spiritual forces at play in our lives. They deal with three phases of our life: consciousness and the outer concerns of life in society; subconscious, or the search inward to find who we truly are; and superconsciousness, the development of a spiritual awareness in the larger context of life. When many major arcana cards appear in a reading then the events taking place are largely out of our hands (in other words, the universe is doing its work) and there are big lessons being learned. The minor arcana is made up of four suits – Wands, Swords, Cups, and Pentacles. The association of these four emblems with magical practice and underlying spiritual truth goes back at least as far as the Middle Ages. These emblems stand for the world itself and for human nature, as well as the act of creation of both specific things and the continuous creation of evolution. The four suits are also linked to the study of Kabbalah, and they each are related to God’s name, YHVH, which some translate as Jehovah. I could write an entire book on the esoteric meanings behind the cards. Suffice to say that the minor arcana depict us in our daily lives going about our daily business. Within the minor arcana there are also court cards that depict people and energy depending on the spread. When you have a tarot reading, it’s like taking a picture of your life. You can see the present moment, the recent past, the near future, and the likely outcome that may result if you carry on your current path. The beautiful thing about the future is that nothing is set in stone. Predictable, not predetermined, remember? If a tarot reading reveals a poor outcome, you can take steps to avoid it. The tarot is less about giving definitive answers and more about giving guidance. To me, the tarot is best summarized by the message of the Hermit card. Tarot is a tool for introspection. Just as the hermit in the card takes off alone with his lantern, the tarot provides a light in the darkness as we find our way through life.